Just in time for summer fun, MGM and Paramount release Sherlock Gnomes, a hilarious and a hilarious and heartfelt adventure the whole family can enjoy at home! 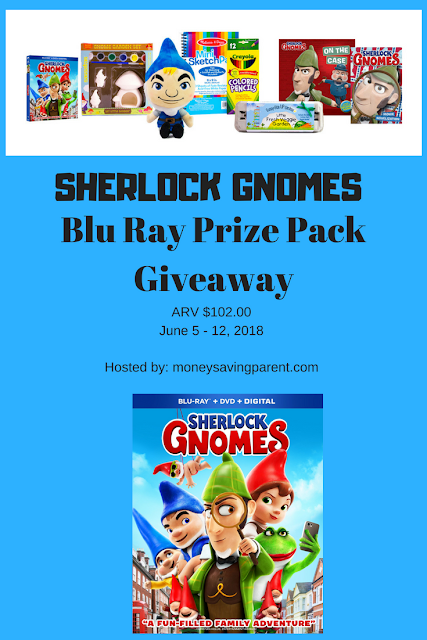 Available on digital June 5, 2018 and on Blu-ray Combo Pack and DVD June 12, 2018, SHERLOCK GNOMES is a rollicking adventure from the director of Kung Fu Panda. It boasts the all-star cast voice talents of this action-packed sequel features the voices of returning cast, James McAvoy, Emily Blunt, Michael Caine, Maggie Smith, Stephen Merchant and Ozzy Osbourne, plus Johnny Depp as Sherlock Gnomes, Chiwetel Ejiofor as Watson and Mary J. Blige as Irene. And, there are brand new songs from Elton John, Bernie Taupin, and Mary J. Blige! The beloved garden gnomes from GNOMEO AND JULIET are back for a whole new adventure in London. When Gnomeo and Juliet first arrive in the city with their friends and family, their biggest concern is getting their new garden ready for spring. However, they soon discover that someone is kidnapping garden gnomes all over London. When our favorite team of Gnomes discover their friends and family have gone missing, Gnomeo (James McAvoy) and Juliet (Emily Blunt) turn to the legendary detective Sherlock Gnomes (Johnny Depp). The famous detective and sworn protector of London’s garden gnomes arrive with his sidekick Watson to investigate the case. The mystery will lead our gnomes on a rollicking adventure where they will meet all new ornaments and explore an undiscovered side of the city. Working together, the mystery takes them beyond the garden walls and across the city on an unforgettable journey to save the day and bring the gnomes home. 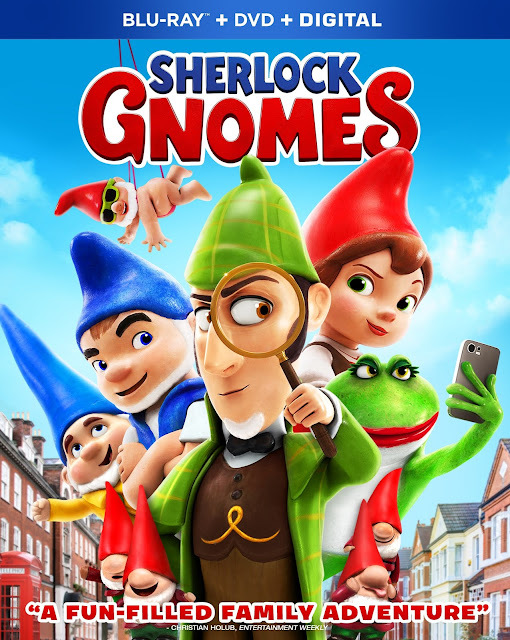 The Sherlock Gnomes Blu-Ray/DVD Combo Pack includes access to a Digital copy of the film as well as the following: (on Blu-ray only) · Feature film in high definition · Bonus Content: Gnome is Where the Heart Is – Go behind-the-scenes with the all-star cast All Roads Lead to Gnome: London Locations in Sherlock Gnomes Miss Gnomer: Mary J. Blige and the Music of Sherlock Gnomes Stronger Than I Ever Was – Enjoy the brand new music video performed by Mary J. Blige How To Draw – Learn how to draw your favorite characters: · Sherlock Gnomes · Watson · Moriarty · Goons And, Animating Sherlock Gnomes – Discover the magic behind the movie’s animation! Sherlock Gnomes Movie Novelization . Enter for your chance to win. Must be 18+, valid US. Addresses only. Money Saving Parent is not responsible for prize fulfillment. By entering you give Money Saving Parent and our sponsor permission to contact you via email regarding your prize and shipping. All other terms and conditions as stated in the giveaway form.